The Nature’s Harvest® bread information, coupons, gift pack, and additional giveaway have been provided by Nature’s Harvest® bread so that I could try the product and share my thoughts and information about Nature’s Harvest® bread. The opinions expressed in this post are my own and do not reflect the opinions of Nature’s Harvest® bread. I can hardly believe it's almost time for going back to school! With only a little over two weeks left before the girls head back, I am starting my back-to-school lunch planning now so I'm not left scrambling for tasty options at the last minute. Since my kids take homemade lunches every day, I need to find creative, yet tasty and healthy options so they don't grow bored with what I prepare for them. They are both big on having a sandwich for lunch most days, so I like to use Nature's Harvest breads when crafting their sandwiches. 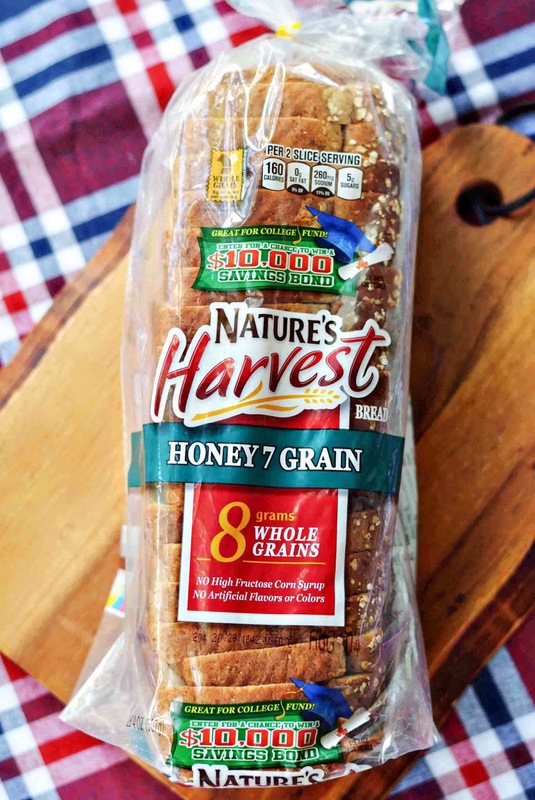 Each variety of Nature's Harvest breads have 8 grams or more of whole grains per serving, and since they aren't baked with artificial flavors, colors, or high fructose corn syrup, they are a great choice for a nutritious lunch. 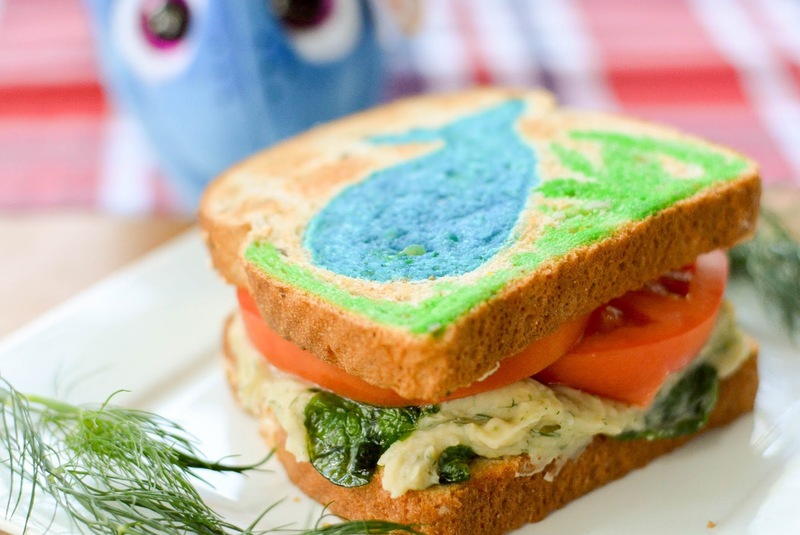 My family really loved the new Finding Dory film that was out this summer, so we thought it would be fun to create a new sandwich inspired by the film to add to our back-to-school lunchtime recipe box. We made a Toasted White Bean, Dill, and Spinach Sandwich with a painted on fishy. Mix a few drops of desired shade of food coloring into a bit of milk. Using a small, food safe paintbrush (found in the baking section of the craft store) dip the tip into the milk mixture and *lightly" paint over your dry bread. The key here is to not soak the bread. A light coating is all it takes. Once your painted picture is finished, toast bread as normal to set. Heat oil in a small skillet. Add spinach and cook for 1 minute. Remove from pan and place on paper towels to cool. Heat beans, garlic, lemon juice, and dill until cooked through. Place in a blender and pulse until you get a good, thick bean paste. Place cooked spinach leaves on bottom layer of toast. Top with bean mixture and season with salt and pepper if desired. Add sliced tomato, then top piece of toasted bread. Serve. Be sure to look for Nature's Harvest with special Finding Dory designs on the package in your store's bakery aisle. 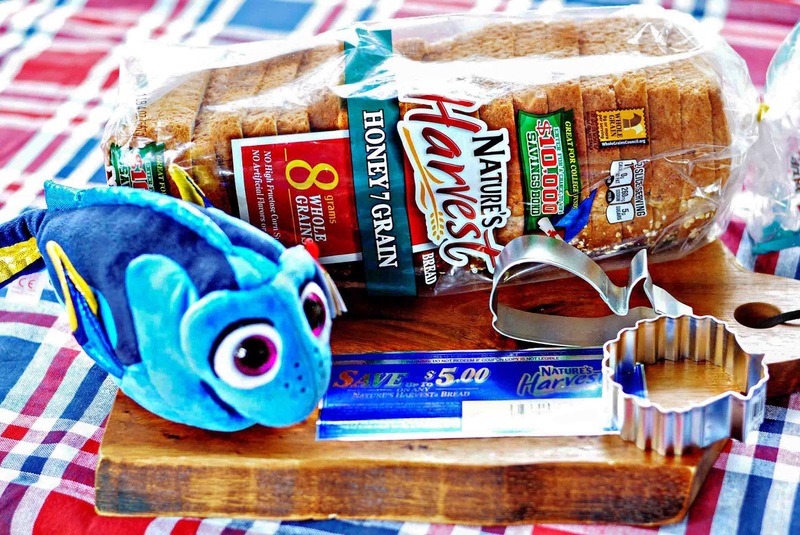 And, up until August 12, fans can get a free Dory Ty® Sparkle Eye Beanie Boo™ plush toy with the purchase of 4 Nature's Harvest breads! Swim by www.wholegrainsplash.com for more information. Find these varieties in most major retailers nationwide. One lucky reader is going to win a coupon for a Free Nature's Harvest bread of their choice and 2 fish-shaped cookie cutters. Giveaway is open to residents of the US. No PO Boxes will be accepted. Giveaway will run through 8/10/16. Winner will have 48 hours to respond before a new winner is selected. is the blue fish a pencil case? It is really cute! No to food colours, yes to what is inside the samich! I like spinach pure or bean pure put into a samich, with some garlic! Oh wow the bread painting is such a clever idea!!! :) Enjoy the rest of the hols!! haha what will they come up with next. I suppose in this case it is okay to play with your food. This is the kind of bread we love! I like the 18 Grain and Seeds Bread! I can't always find it, and sometimes have to go with something different. That's what my family prefers. I love the colors Allison is putting on her bread. How fun! That's so cute! It's almost a shame to eat it. I think my kids would love doing this. Kids would definitely finish this sandwich! I am sure their friends at school would want to make something like it for themselves too. Thanks for the idea. I also would love to try Nature's harvest bread. What a fun idea. I don't think I have ever seen a painted sandwich like this before. What a super cute idea! I have never seen a painted sandwich before! That looks so delicious! I never would have thought to paint the bread! Adorable! I'll be doing this often, now. I love the toasting tip. We often eat the whole wheat bread and toast and breakfast. Gotta get those morning carbs. Oh my goodness, this is awesome! 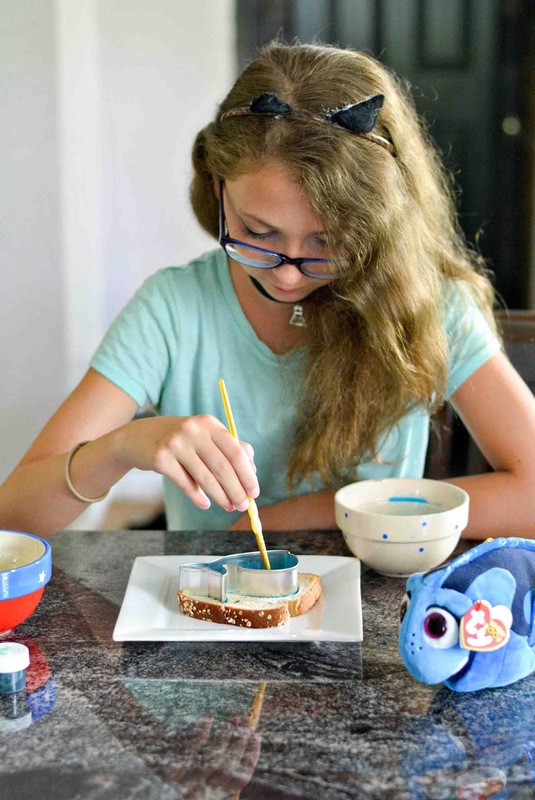 I had no idea about bread painting and my kids would go crazy over it. Now this is a cute idea. My family loves bread and this would just take it to a whole 'nother level! That is a fun sandwich. 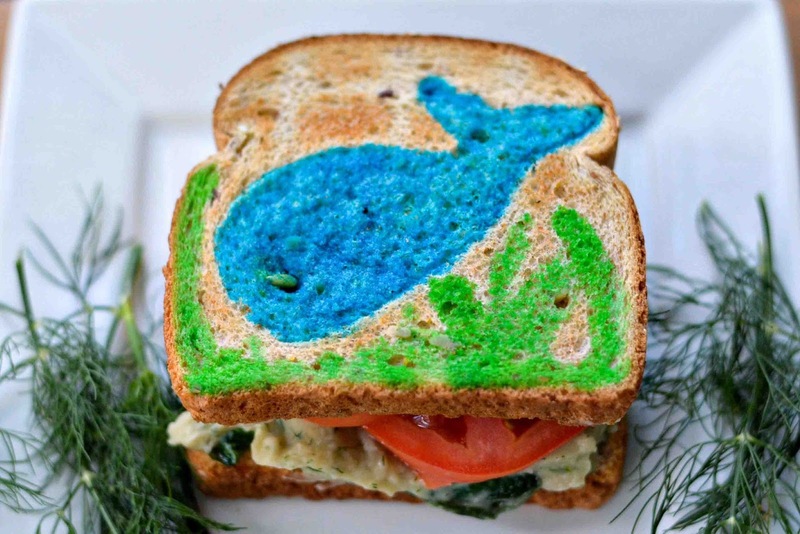 I'll have to paint my kid's sandwiches this year. I'm sure they'll be happy to whip them out and eat them up at school then. We were going to see Finding Dory today but they took it out of my theaters, at least the nice ones. I didn't think we waited that long. Aww, I love the design and I do like Nature's Harvest breads. I still need to see Finding Dory though. Oh, this is so cute. My son will surely like this. I wish we have something like this in our place. My son would adore this. We're still talking about Finding Dory. The sequel was well worth the wait. This is so cute! When we watched Finding Dory, my son was so happy and I am sos ure he will be happy making his own sandwich! It's important to keep the kids interested in the food that you prepare especially when it comes to eating healthy or giving them healthier options. I love the idea of bread painting! I have always liked the honey wheat whole grain bread. No high fructose corn syrup is what I look for in ingredients. I love this idea for decorating sandwiches. My kids are going to love opening up their lunches this year. I LOVE this idea. What a great surprise for the kids first day back to school! That is so fun and creative! I'd have a hard time not biting in until the artwork was complete and photos were taken. That's really cute and creative. It's a great way to get kids to eat bread. I know that, as I was bringing my daughter up, she would not hardly eat bread. If she could have done this craft, she might have eaten more bread. My favorite is their potato bread. I love making grilled cheese with potato bread. My favorite is the honey 7 grain bread. I like their Butter Wheat Bread Made with Whole Grains! My favorite Natures Harvest Bread is the 18 Grains & Seeds. It's great for Turkey sandwiches and PB & J! The Whole Wheat is my fave. That's a good sounding sandwich, I've never tried anything like it (but now I must). I love the bread painting idea too. Def. doing that with my two. I like the Buttermilk Made with Whole Grain Bread. I like their 100% WHOLE WHEAT HOT DOG BUNS. It's the perfect size for my sandwiches. My favorite Nature's Harvest product is Honey Wheatberry bread. I really love the honey bread. My children would love this, thanks. I love the way you write! I've never tried it before, but I'd like to try the honey wheatberry bread. It sounds great! I like the light multigrain 40 calories per slice bread. It tastes great and is good for you. I would like to try the LIGHT 100% WHOLE WHEAT 40 CALORIES PER SLICE BREAD. My families favorite is the Honey Wheat Made With Whole Grain bread. I like the Honey Whole Wheat bread. My mom introduced me to the brand. My favorite is their Whole grain wheat bread. My favorite would definately be the oatmeal bread. Just delicious! I like Nature's Harvest 100% Whole Wheat Light Bread at only 40 calories per slice. Stone ground 100% whole wheat bread, since the doctor recommend the whole wheat. I enjoy having the 8 grain Bread and also love the Potato Bread . I like all breads, but I think the Potato Bread is my favorite. Thanks. I like the: My favorite Natures Harvest Bread is the 18 Grains & Seeds. It's great toasted, and makes a nice sandwich too. I like the white hot dog rolls made with whole grain. They are very tasty. I generally do not like whole wheat products. I really want to try the 18 grains and seeds bread but it isn't available in my area so I have to go with what I have tried which is the Honey Wheatberry bread. One of my faves is the Honey 7 Grain bread. Love to make BLTs with it. 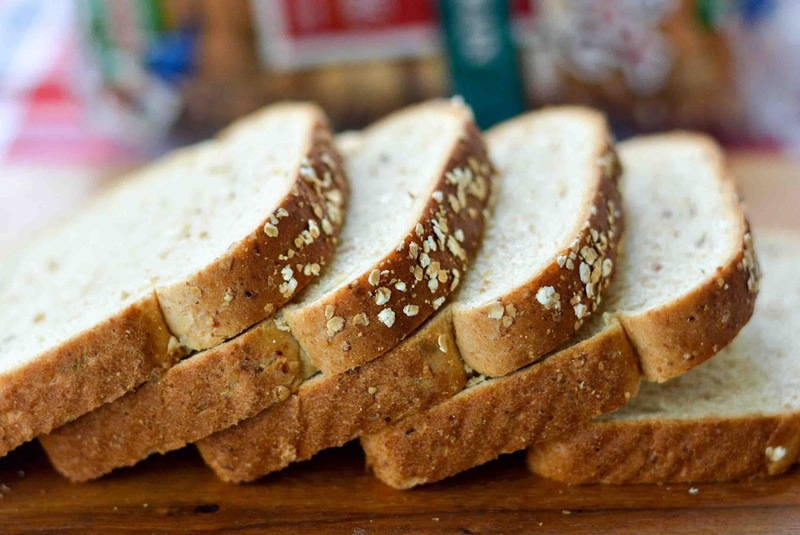 My favorite would be the honey-wheat-made-whole-grain-bread it always tastes so fresh! My favorite Nature's Harvest product is the potato bread. My favorite is their Honey 7 Grain Bread. It makes the best sandwiches.